As we prepare to send off our Maymester programs in less than a week, we decided now would be a good time to introduce to you our top 5 Maymester programs, as indicated by final enrollment. If you are interested in one of these programs for 2015, you better apply early! What began as just an Art & Astronomy program earlier this year, quickly took on a new audience when Journalism was added into the mix. The student response to the diversity of this program has been positive. Students are taking advantage of pursuing credit for their major while also counting courses like Astronomy toward their Physical Science requirement at UGA. And from what we have seen, there has never been a more excited team of faculty interested in working together to create a holistic approach to study in Costa Rica than the academic quartet of Benjamin Britton (Art), Andy Kavoori (Journalism), Allison Smith (Astronomy), and Julie Spivey (Art). We are now entering year four of one of our most popular programs – Advanced Spanish, Creative Writing, & Photodocumentary. Aurora Thorgerson takes the students on a historic journey of the Spanish language through film and more specifically, Latin American cinema. On the other hand, we have a creative writing and photodocumentary component where students creatively capture their experiences abroad. If the 2013 students were capable of work like this, then we can’t wait to see what Spenser Simrill‘s students come up with this year! 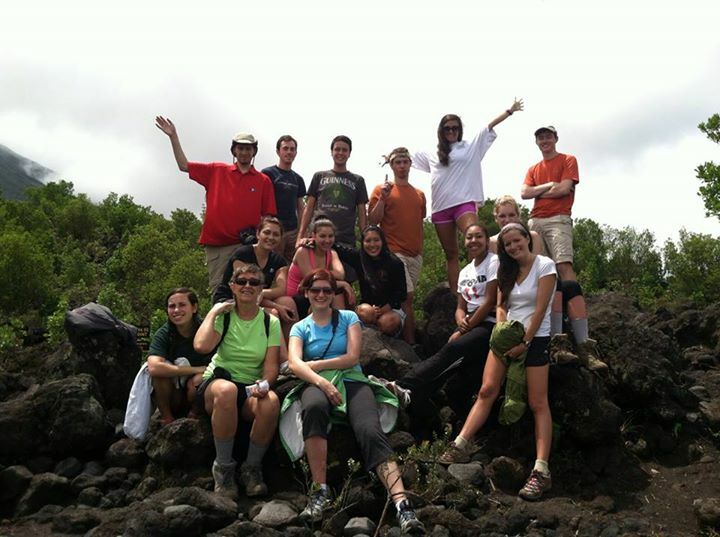 Before UGA Costa Rica was truly a campus, it was a field research station. That means Tropical Ecology is one of our longest-running programs because ecology research was being done before the program actually existed! Not only that, but instructor Scott Connelly spent years of his life living in Costa Rica specifically studying this environment. It’s no wonder students keep coming back for this program year after year. For the second year, Outdoor Recreation and Geology have paired up and it seems to be a good fit if enrollment numbers have anything to say about it. In the past, we have seen Outdoor Recreation and Astronomy paired up in Costa Rica which didn’t get quite as much interest as this current duo. It makes sense though, what better way to study the solid features of the area and the processes by which they change than to explore them through recreation? It makes sense to us! Marta Patino-Douce and Jennifer Stewart are up for the adventure of leading this group on an academic adventure through Costa Rica. This is the first year for the Nutrition Education program in Costa Rica and it is making quite a splash for a first-timer, taking the number 5 spot on our list. Students will have the opportunity to work closely with the University of Costa Rica and Calderón Guardia Hospital in San Jose while learning about food, healthcare, and hospitals in Costa Rica with Vanessa da Silva. Check out our website for a full list of UGACR programs offered throughout the year. As Friday was a national holiday in Costa Rica, we thought we would give you a brief run-down of what to know about Juan Santamaria Day and the Battle of Rivas. 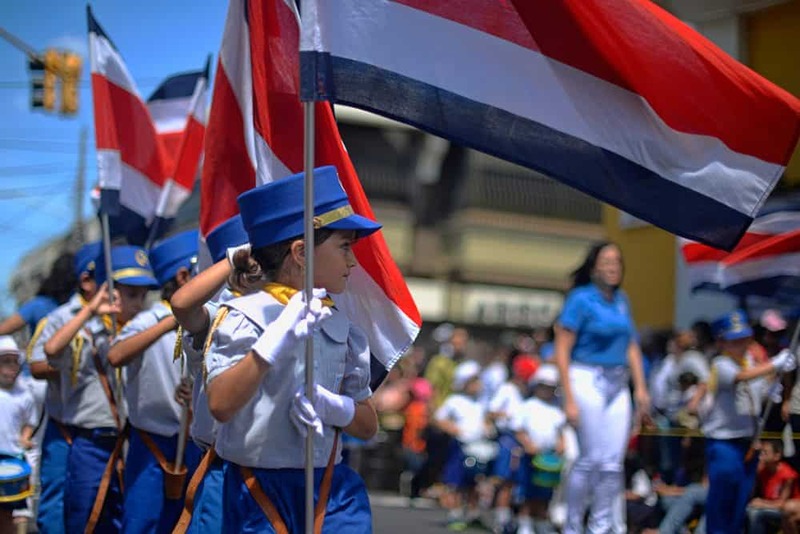 1) Some Background Info: April 11th, also known as Juan Santamaria Day, marks the Second Battle of Rivas, and is a mandatory paid holiday in Costa Rica. 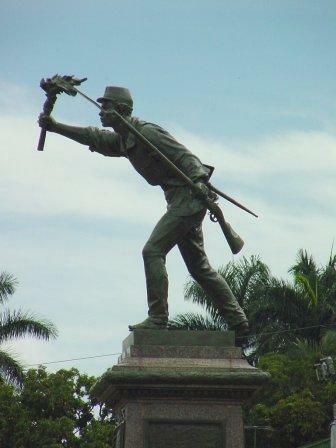 The Second battle of Rivas occured on April 11th, 1856, between the Costa Rican militia (under the command of General Mora) and the Nicaraguan forces of William Walker, an American filibuster who had declared himself president of Nicaragua that year. Walker’s plan was to conquer Central America and enslave the population. Costa Ricans fought back against the attempt, and the country’s only military hero was born. 2) Who is Juan Santamaria: Juan Santamaria was a poor drummer boy from the province of Alajuela who volunteered for Costa Rica’s militia when the fighting broke out. 3) What Went Down: Legend has it that at the Second Battle of Rivas, Costa Rica’s commanding officer asked for a volunteer to burn down the hostel where Walker’s men were staying. Many soldiers tried and failed. So, Juan Santamaria volunteered. He was just a boy and the illegitimate son of a poor single mother. He volunteered under the singular condition that if he died, someone would look after his mother. Torch in hand, Santamaria advanced through enemy fire toward the hostel. Though he was mortally wounded, he succeeded in reaching the hostel and burning it down before his untimely death. This led to Costa Rica’s victory at the battle. 4) Aftermath: Whether or not you believe the story, Juan Santamaria is now a national legend. On April 11th all government buildings close, and citizens receive a day off with regular pay. 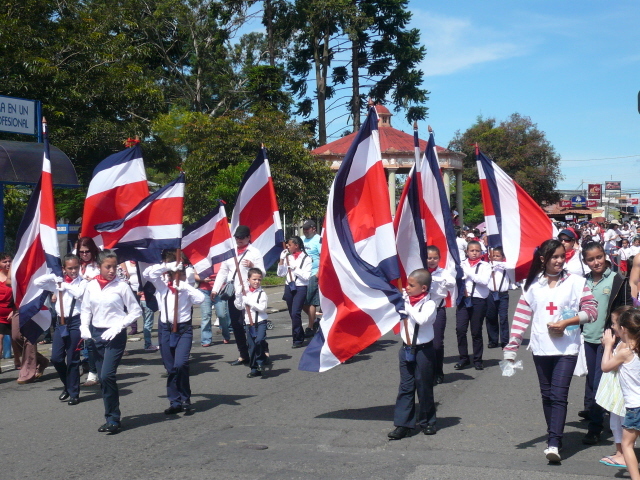 Santamaria’s act of heroism (which confirms CR’s sovereignty) is commemorated on this day by parades, civic programs and fireworks. Additionally, anybody who has ever flown into San Jose knows that Costa Rica’s main airport is called Juan Santamaria International Airport. Statues of Juan Santamaria can be found at the airport, the park that shares his name in Alajuela and before the Congress in San Jose. 5) The Whole Point: Legend or not, the story of Juan Santamaria lives on in the hearts of Costa Rican’s and is a part of the national identity. They cherish the heroic memory of the young, lower class boy who sacrificed himself to save his country from slavery while thinking only of his mother. What matters most in the end is that Juan Santamaria represents courage, fidelity, and loyalty and devotion to one’s country and people. Even though our UGA Spring Semester students have entered their last couple of weeks in Costa Rica, they have done and seen some amazing things in their time here. Today we have some of the most memorable experiences from the past few months. Take a look and remember, it’s never too early to think about spending your next spring semester here! 1) A forest full of inspiration. Our campus is surrounded by beautiful forest trails where strangler figs and beautiful bird calls inspire wonder. Can you think of a better location to take an ecology class? Whether taking a tour in the Monteverde Cloud Forest, or walking to breakfast in the morning, students have the chance to see real-life examples of terms such as biodiversity and adaptation. 2) A welcoming community. 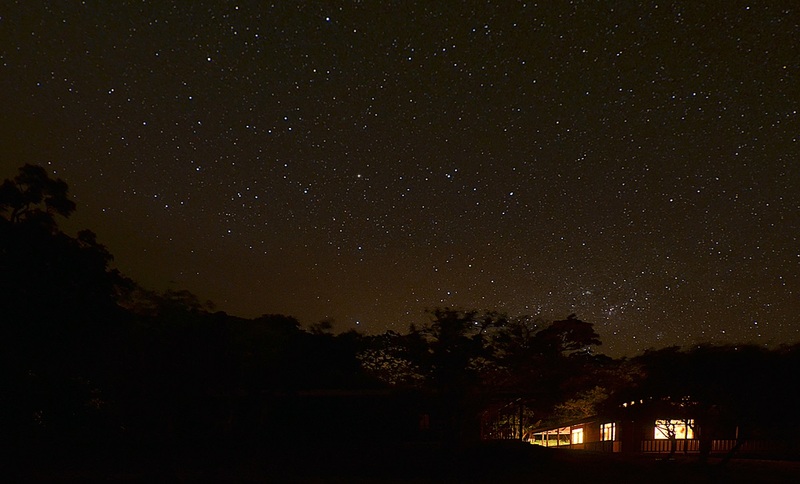 Have you ever stayed in a Costa Rican home? As part of their cultural experience here, our students spend time in homestays with local families. They become part of the family for a week or more and might learn how to make empanadas or spend a Saturday swimming in the river. One student is working on a project to document the history of San Luis through interviews and digitizing old photographs. His project has taken him to old, wooden houses where whole families have been raised and through many stories of the past. 5) Enjoying campus life. We all know about the beauty of the forests and mountains surrounding UGA Costa Rica. But the campus itself also provides a warm, friendly environment to study, relax, and build friendships. These memories of playing ping pong, eating ‘smores, or lining up for hot chocolate every night will not be easily forgotten. Happy St. Patrick’s Day Everybody! We just wrapped up one of our busiest weeks during the whole year — spring break! We had student groups come from all over the country to learn and take in the beauty of their surroundings. Here’s a list of some of the week’s highlights. 1.) Saving the world, one tree at a time. 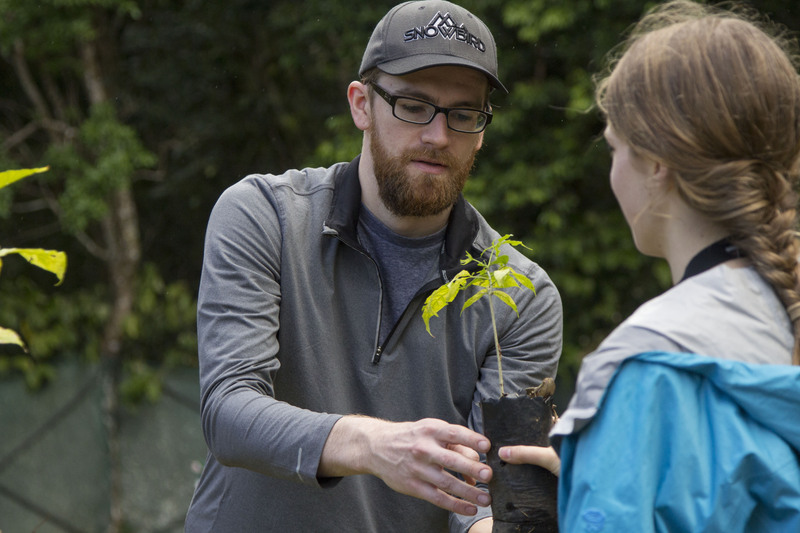 One of our spring break programs focused on reforestation efforts in the Monteverde area. This group helped give our tree nursery a makeover that standardized beds for future research projects. 2.) Catching your own dinner – Like everything else here, even dinner is a hands-on activity. Students had the chance to wade into the tilapia pond to catch their own fish. Students had to put on safety goggles before getting in the water because the tilapia can jump! And even for those not brave enough to get in the water, it was entertaining to watch. 3.) 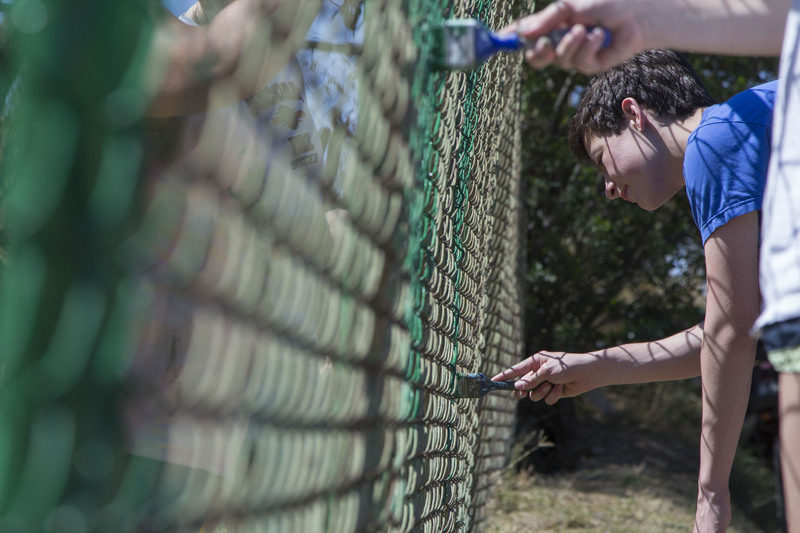 Brushing up on San Luis – Our visitors from Athens Academy gave a wonderful gift to the community of San Luis by spending the morning painting the fence around the cemetery. The area is maintained by volunteers and the effort spent to make it look its best was greatly appreciated! 4.) Watching the sun go down in paradise. Our front porch is always a great place to watch the sun set. And the few minutes before dinner is the perfect time to relax from an activity-packed day. Every sunset is different, but this one was so beautiful it had our guests scrambling to snap a photo before it disappeared. Student Alexandria Desantis is ready for her zip-lining adventure! Photo courtesy of Alexandria Desantis. 5.) Flying through the Cloud Forest. Well, not flying exactly. But gliding over the tops of trees on a wire is about as close as it gets. 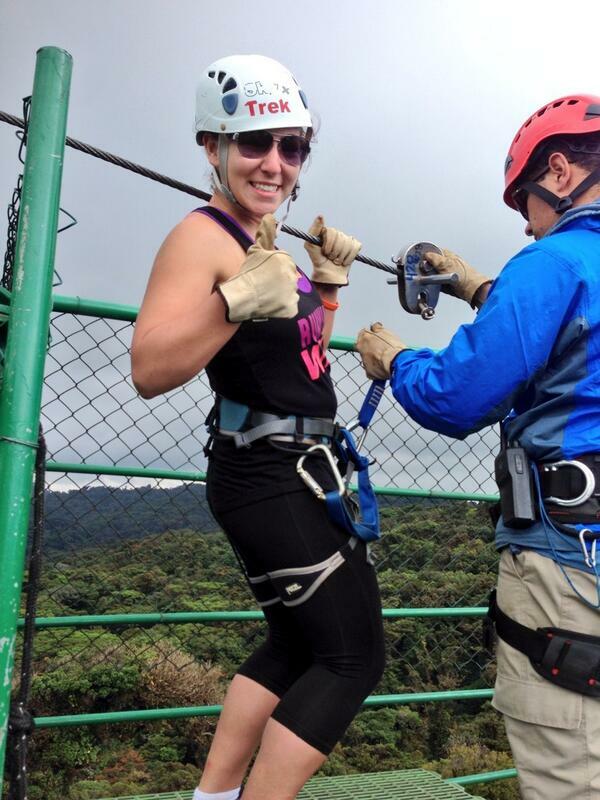 Going zip lining is a great way to get that thrill of flying as well as a new perspective on the cloud forest. If you’re looking to get in the best shape of your life here in Costa Rica or just maintain that toned physique, there are many options on campus and here in San Luis de Monteverde. In fact, you’ll probably do these activities just because they’re so much fun! 1.) La Trocha – What we call La Trocha is the steep, paved portion of road that connects San Luis up to the Monteverde Cloud Forest and the downtown area of Santa Elena. As punishing of a walk as it is, there’s nothing like the feeling of accomplishment once you get to the top. And if you do walk up, it’s a great excuse to stop at the Monteverde Cheese Factory for a milkshake. Take a look at this video to get an idea of what it’s like to make the walk up and down. A big thanks to UGACR staff member Geovanny for the ride! 2.) Hiking – What better way to get into shape than by taking in the beautiful scenes of Costa Rica’s natural landscapes. Navigating the ups and downs of the forests will certainly challenge your leg muscles, but you hardly notice as you take in the enormous strangler figs and birds of paradise. Make sure you keep an eye out for a sloth hidden in the canopy. 3.) Dancing – There’s no better way to get your heart rate up than to take a dance class at UGACR. You can learnsalsa, cumbia, merengue or even bachata. Once you have the basic steps down and learn a few turns, you can try your moves in a dance like the one we had this Saturday at the Alto de San Luis School. 4.) Soccer – Without a doubt, the sport of choice here is fútbol. Every week, staff and anyone else interested get together for a pickup game of soccer on our lawn in the middle of campus. You can show off your skills, or just try your best to keep up. 5.) Zumba – And if you still haven’t had enough, you can try a Zumba class at the San Luis community center. The upbeat music and fun dance moves are sure to get you moving. Not to mention it’s a great chance to see more of the San Luis community. One of the best things about our campus in Costa Rica is the number and variety of birds found here. In fact, we have nearly 250 species, so it’s a challenge to pick only five! 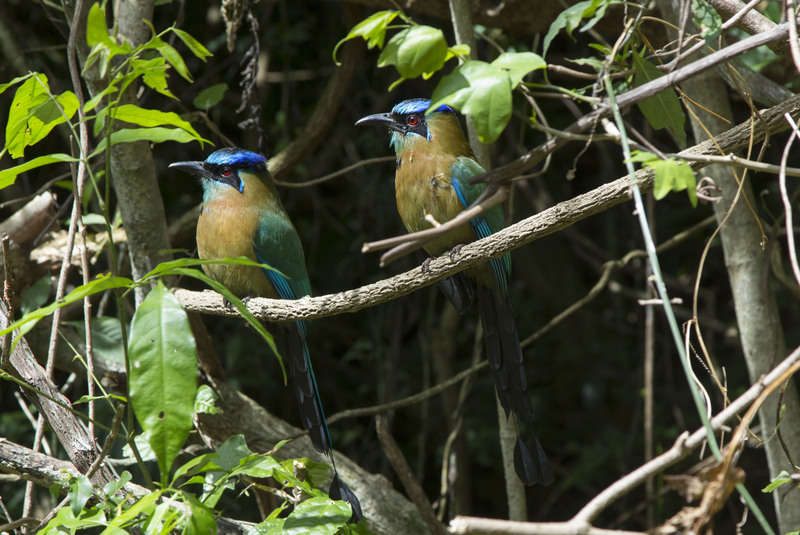 Blue-crowned Motmot — The Motmot is one of the most beautiful birds we see on campus. When he is in the shadows, he blends right into the green and brown of the forest. But when he perches on the edge of the trees, the light shows his dazzling blues and oranges as well. Motmots are sometimes called the poor man’s Quetzal, because although beautiful and stunning like the legendary Resplendent Quetzal, they not as elusive. I like to think they are just more friendly. 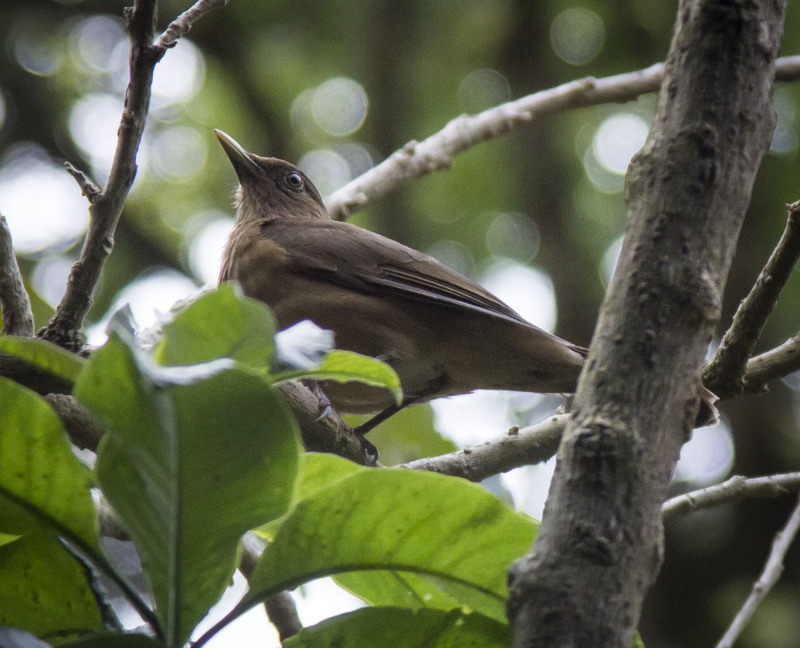 Clay-colored Thrush – The clay-colored thrush, also known as the clay-colored robin is the national bird of Costa Rica. Although the bird does not have the bright colors or distinctive plumage you might expect from a tropical bird, he does have a good soul. Because he is widespread across Costa Rica and lives close to humans, he is well-known across the country. His beautiful song has also endeared him to the people of this country. 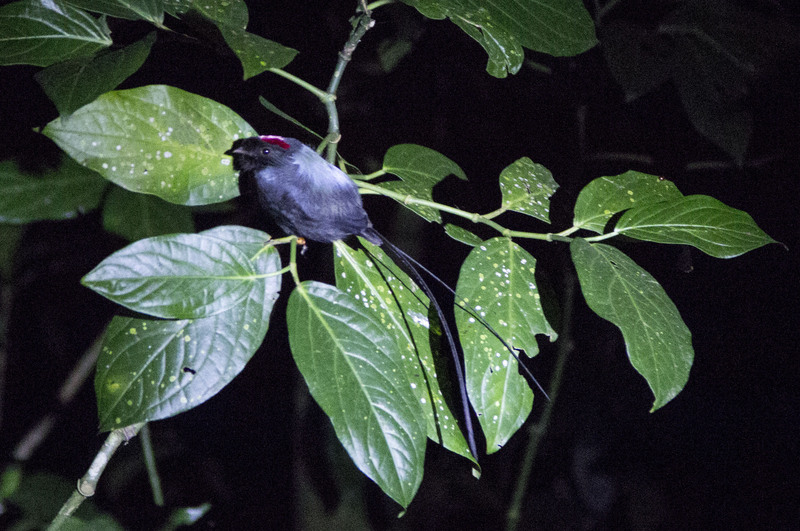 Long-tailed Manakin – In addition to his stunning coloring, the long-tailed manakin’s graceful tail sets him apart from other birds. They also have an unusual mating ritual where two males must cooperate in performing an elaborate dance to impress the female. If they succeed, only the alpha male of the pair gets to mate. 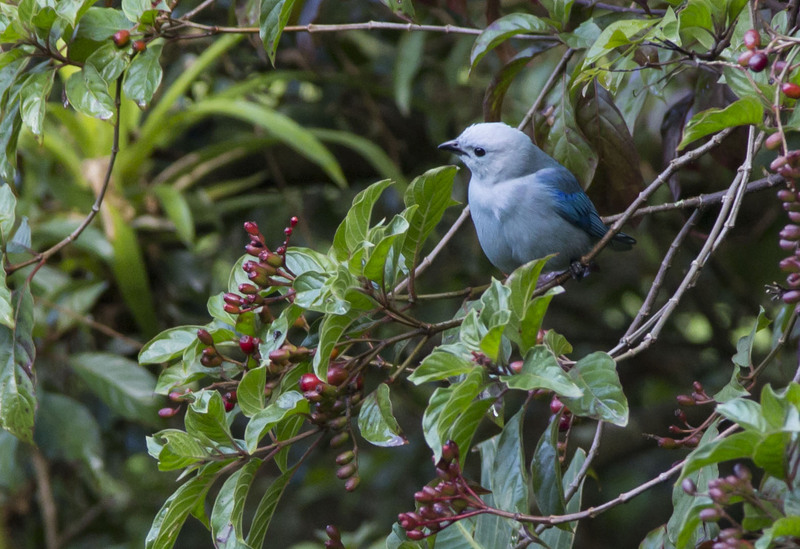 Blue-Gray Tanager – These birds are easy to identify because of their bright color. You can find them hopping from branch to branch looking for berries. We often see them on the front porch of the Student Union. 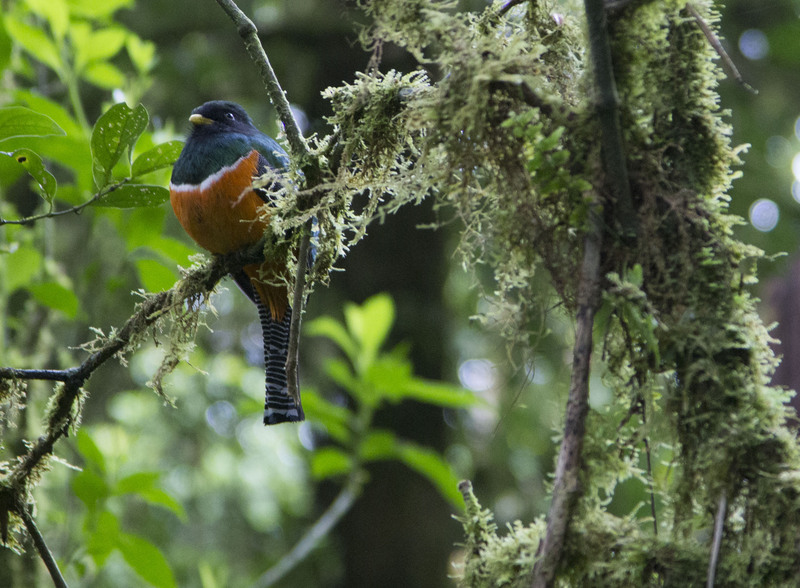 Orange-bellied Trogon – This Trogon is found in humid tropical forests. Lately, one has been sleeping in the same tree along the Casita Trails, so it has been a treat to see him sleeping during our night hikes! Some of you might not know this, but UGACR actually has an Instagram account where we post super awesome pictures! This week, however, we solicited your pictures. We have compiled our top five (in no particular order) #ugacostarica Instagram pictures to date! So enjoy and make sure to follow us to see more cool shots! This first shot captures the easygoing feeling and the beauty of the campus. Most of the shots we found were sky pics, but that’s no surprise with a sky as beautiful as this one! Life is never dull at UGACR. Who would’t be thankful for this lovely rainbow? Although those are our top 5, we would like to add an honorable mention. This shot may not be a scenic view of campus, but it is one of our favorites because it expresses excitement to be involved in one of our programs. We are thrilled to have you too! 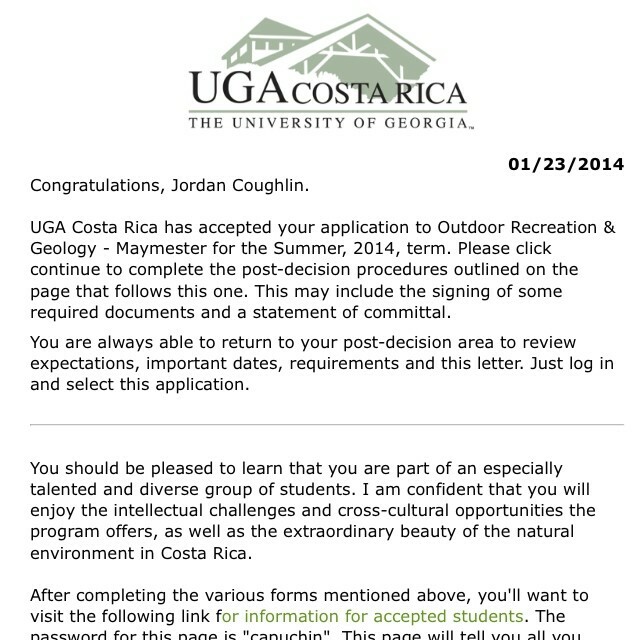 GOT ACCEPTED TO THE#UGACOSTARICA STUDY ABROAD PROGRAM!!!! I cannot voice the amount of excitement exploding in my entire body. That’s all for now! Make sure you follow us @ugacostarica for new pictures every day!